Signature :Bizen Suke Fujiwara Munetsugu. Shinshinto: Jyo Jyo Saku: Musashi province. Blade length : 68.9cm or 27.13 inches. Sori :1.8cm or 0.71 inches. Width at the hamachi : 3.15cm or 1.24inches. Width at the Kissaki : 2.47 cm or 0.97inches. Kasane :0.72 cm or 0.28 inches. and ookissaki style gorgeous shape. On the front, Suken, Bo-hi and Gomabashi Bonji are engraved. On the back side, Gomabashi and Bonji are engraved. Jigane :Koitame hada well grained with jinie attach clear nice texture. Shirakawa province as a son of Koyama Munehira. His name was Soubei. He was working for Matudaira Daimyo family as a sword making Samurai. Saidanmei and also possession name on the tang of the blade. smith in late Edo period and without any faults among his swords. This sword is registered as a tangible cultural properties of Mie prefecture. 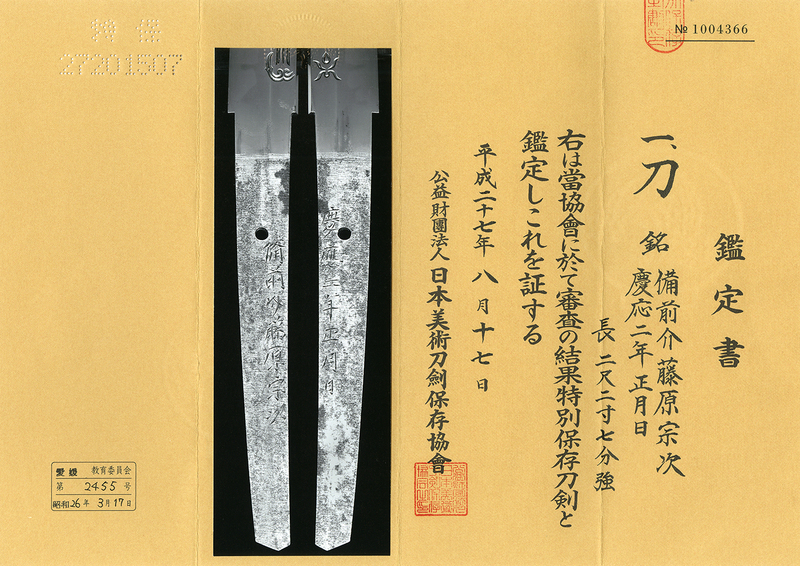 He studied the way of cut well swords from Yamada Asaemon who was cutting tester at that time. asaemon tested his swords for Tameshigiri. From Aoi-Art:This sword is a copy of the famous Kanemitsu wonderful hspe ookissaki style. is mentioned. According to the tang, the engraver is Yoshitysugu . So this sword is also engraved by Yoshitsugu. and same design of Bonji and Gomabashi. This sword seem Kanemitsu utsushi fantastic Horimono. We recommend this high quality sword with nice Horimono(engraving). Aoi Art estimation paper. whole Oshigata.